While some Quebeckers dream of beaches and a turquoise sea with the approach of winter, outdoor enthusiasts look forward to the first snowfall. However, sporting types are not the only people who can take advantage of cold-weather outdoor activities. Winter also means Christmas fairs, winter festivals, winter fruit picking or even sliding downhill in a taxi ski. There are scores of products out there to help us make the most of the snowy season. In the last few years, Quebec has developed an increasing number of creative events and activities. The following article presents some of these, though it primarily discusses innovations from outside the province to provide inspiration. 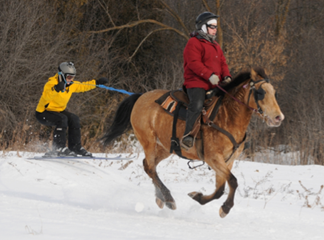 Resorts now propose numerous alternatives to traditional downhill skiing. Valfréjus, a resort in the Savoie region of the French Alps, offers courses in speed riding, an activity that combines skiing and paragliding. Equipped with a type of small paragliding sail, skiers can jump and fly several metres above the snowy slope. The Smugglers’ Notch ski resort in Vermont offers airboarding to thrill seekers. Wearing a helmet and lying flat on their stomachs on an inflated sled, airboarders must learn to use their body weight to steer headfirst down the slope. In fact, a short instructional clinic is mandatory for first timers. The practice of this sport is outlawed in many resorts, because of the risk of collision with skiers and snowboarders. Other resorts allow it only in specially marked areas. Snowscooting is another sport that is becoming more popular in Quebec ski areas. 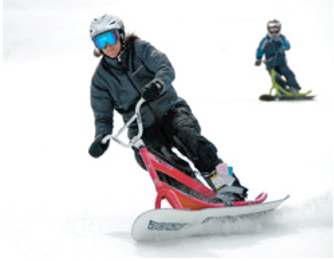 Similar to a snow bike without a seat, a snowscoot is a two-piece snowboard, held together with a frame. Snowscooters use the handle bars to steer down the hill. 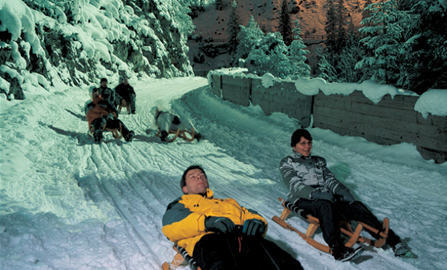 In Switzerland, the floodlit Preda-Bergün toboggan run is a winding six-kilometre toboggan run connecting the villages of Preda and Bergün. Tobogganers take the train to reach the top of the run. Taxi skiing (sometimes called adapted or seated skiing) enables non-skiers and those with reduced mobility, such as those who used to ski but no longer can, to hit the slopes and enjoy the alpine scenery while comfortably seated in a ski-chair guided from behind by an instructor. 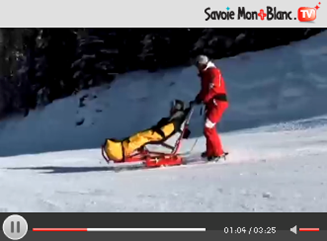 Taxi skiing is offered at Mont Blanc in the Savoie region of France. The short video below illustrates the concept in action. Innovative urban events such as Igloofest, the Montreal High Lights Festival and the many activities organized by the Québec Winter Carnival help create a festive atmosphere that gives winter destinations a competitive advantage. 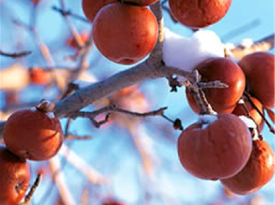 Some orchards invite visitors to pick apples in the winter, for the production of ice cider, making it into a family-oriented activity a little like the U-pick system popular in the fall. 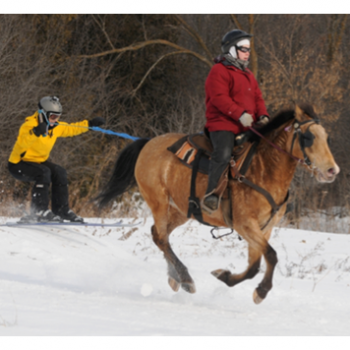 For example, for a few weekends in January, the Vergers Lafrance in the Lower Laurentian town of Saint-Joseph-du-Lac offer cross-country ski trails, toboggan runs and special activities to members of the public who help harvest the apples. 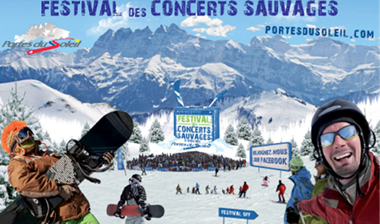 In Switzerland, the Portes du Soleil ski area, which includes 12 different resorts, will host the second edition of the Festival des concerts sauvages, which has been renamed the Rock the Pistes Festival. During this event, French pop singers perform on temporary stages built right on the ski slopes. The exact time and location of these free shows are texted to festival-goers, the day before. 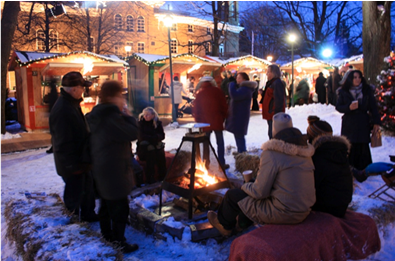 Christmas fairs have gradually become a tradition and a major event for many Quebec municipalities. They showcase regional products, provide a boost to the surrounding area, and create an enchanting ambiance that attracts locals as well as tourists. Any discussion of winter in Quebec must, of course, include Quebec City’s Ice Hotel, which is rebuilt every year and is always very popular. This year, Montreal is following suit with an ambitious plan for a Snow Village on Ile Sainte-Hélène. In addition to an ice hotel, the village will feature an ice chapel, heated glass igloo, meeting rooms and a restaurant. Some businesses are making winter weather conditions part of their marketing strategy. For example, the Mt. Bachelor ski resort in Oregon has implemented a sliding price scale that varies according to precipitation, wind, visibility, temperature and number of lifts in service. A non-holiday lift ticket ranges in price from $53 to $73, depending on the weather forecast. The price is set the day before and then posted on the resort’s Website and in social media. A Quebec winter lasts four to six months, more than 200 cm of snow falls, and average January temperatures often dip below -10°C. We can either suffer the consequences, hibernating until the return of warm weather, or we can tackle it head on, promoting winter culture and making it a powerful brand of our tourism industry. – Bissonnet, Jacques et Francine Plourde. «Montréal aura son hôtel de glace», Radio-Canada.ca, 27 septembre 2011. – Demers, Alain. «Initiation au snowscoot à Sutton», Canoe.ca, 15 février 2011. – Folie-Boivin, Émilie. «Un jardin de givre», Le Devoir.com, 8 janvier 2010. – Laflamme, Isabelle. «Plus c’est froid, moins c’est cher», Canoe.com, 10 janvier 2011.